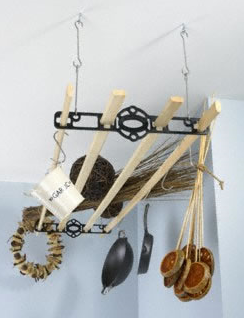 Ok it may be a little quirky but MHM Loves these indoor clotheslines and clothes airers. 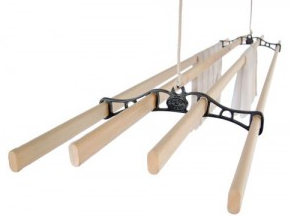 The Victorian Indoor Clothesline is a ceiling mounted clothes dryer that has been commonplace in the United Kingdom and Europe for over 200 years. 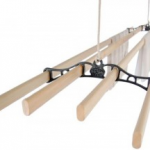 It is a multiple horizontal railed device with two beautiful powder coated cast ends that separate the rails (laths) and secure the ropes that raise and lower the unit by means of two pulleys. It is lowered to be loaded and unloaded, then raised to move your washing up into the warmer air and is out of the way. The product is made by a UK iron foundry, is eco-friendly and easy to install. 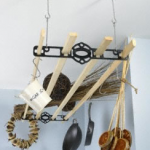 The company also produces a fabulous kitchen ceiling hanging pot rack! The company’s showroom is in Balmain. Click here to go through to their website.